Two Norwegian photographers and one Australian world champion surfer traveled to Lofoten for one spectacular shot. A picture of the northern lights taken by Norwegian photographers Mats Grimsæth and Emil Kjos Sollie is about to go viral. 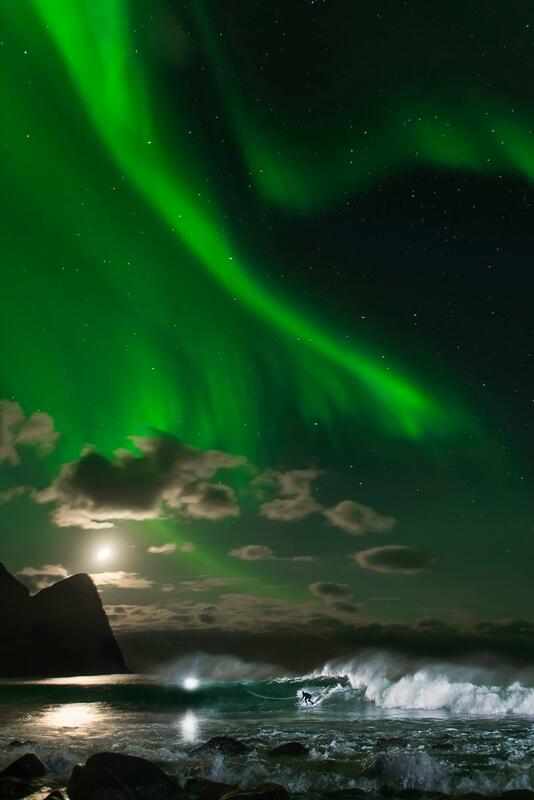 Although you can find any number of northern lights beauty shots if you go looking, it's not every day you get to see a razor sharp image of Australian world champion surfer Mick Fanning plowing through a wave on his surf board in the sea outside of Lofoten while the green shimmering waves of the aurora borealis are snaking their way across the night sky above him. This one picture took an eternity to plan, nearly two weeks to capture and was a real challenge, both in practical and technical terms. Fair weather and northern lights were absolute necessities, while the photographers also faced a dilemma concerning what shutter speed to use. Northern lights need longer exposure, while the fast-paced movements of a surfer require the opposite. According to Norwegian broadcaster NRK, who interviewed the photographers, the solution turned out to be a remote controlled flash that would "freeze" Fannings movement. For it to work, Grimsæth had to carry it out into the water. “To set off the flash, I had to hold it aloft as high as humanly possible while simultaneously keeping my head above water,” Grimsæth said. Fanning took the trip to Lofoten for this picture alone, and tells The Daily Telegraph that he will remember the moment for as long as he lives. "Half asleep, jumping in a wet suit, and then just being wowed by all this stuff." Even though the image might seem too good to be true, the photographers insist to NRK that they have documented their entire process, should the skeptics come knocking. Heading up north for some serious buziness! 落Tnx @elinchrom_ltd and @nikonnordic for supporting the project! They're backed up by award winning photo journalist Kyrre Lien, who has examined the image without finding any trace of manipulation. Here is a short behind-the-scenes video from the photo project, which was a collaboration with Red Bull. This is not the first time Lofoten's waves have received international attention. Earlier this year, French photographer Olivier Morin visited the town of Unstad to document the joys of surfing to be found up north. Should all this make you want to catch some cold waves on a surf board, you might want to check out the beginner's course offered by Unstad Arctic Surf.